1. Wake up. Chug water. 2. Decide that cereal with almond milk and coffee is essential. 4. 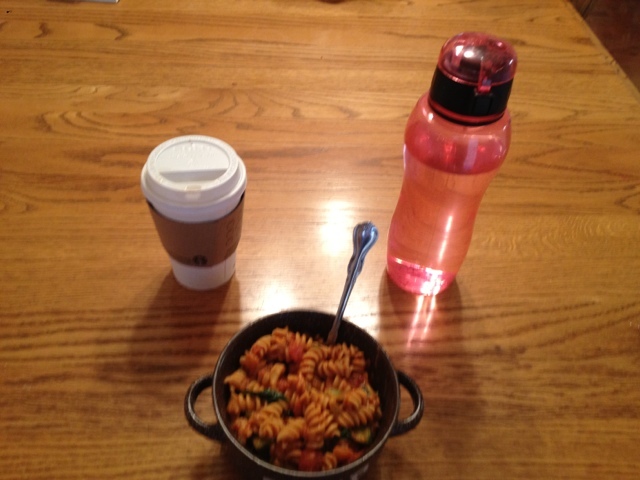 Buy coffee, cereal, and the ingredients needed to make Oh She Glow's 15 minute olive-oil-pasta/ . 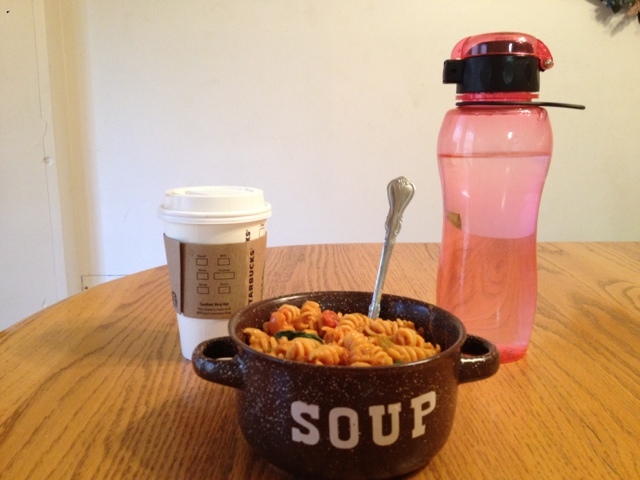 This meal is also essential. 4. Sip coffee while driving home. 6. Decide the pasta sounds better than cereal- go to the link for the pasta and make it in 15 minutes flat, because that's really all the time it takes. 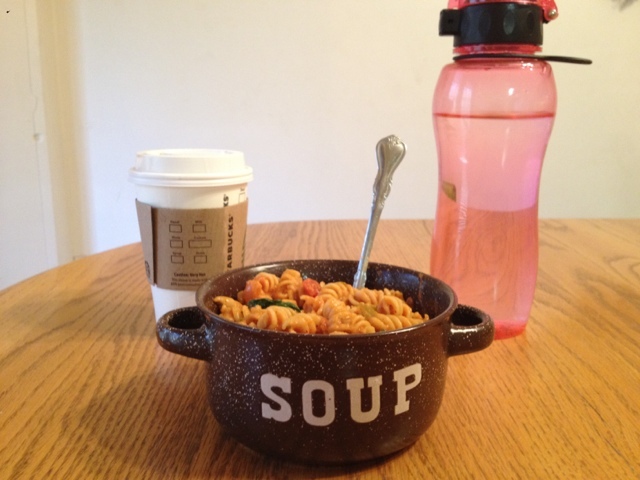 Please note: eating out of a cute bowl makes everything taste better. 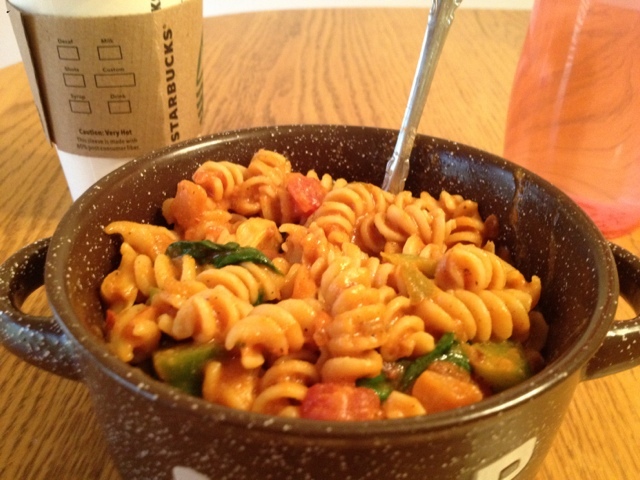 I could seriously eat this pasta every day. Click the link above to find the original recipe posting. The www.ohsheglows.com website is seriously amazing. 1/4-1/2 cup chopped red pepper (optional) I used green pepper because it was half the price of a red pepper at the grocery store! 1/3 cup cooked lentils I left this out because lentils hurt my stomach sometimes. I was going to add chick peas because I had an open can in my fridge, but when I got it out I saw they had gone bad :( I also had an open can of artichoke hearts, so I tore a few up and tossed them in to the sauce. I like the texture it provided. 1.Cook 1 serving of pasta according to package directions. Meanwhile, grab a small pot and turn heat to medium. Add chopped walnuts to dry pot and lightly toast for a few minutes, being careful not to burn. 2. After toasting the walnuts, add in the rest of the ingredients (except for the spinach), to taste. Be careful as the walnuts will sizzle and may splatter when you add in the salsa. Stir well and heat on medium-low for another 7-8 minutes. 3. Place spinach in a colander and rinse. 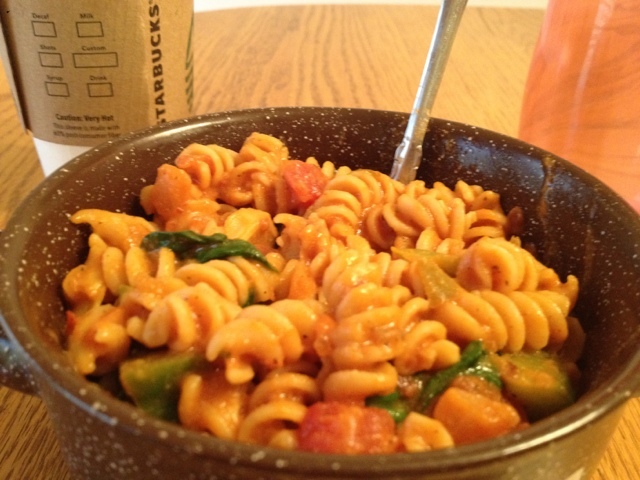 When pasta is cooked, remove from heat and pour onto the colander (with the spinach in it) and rinse lightly. Drain and then add the spinach and pasta into the pot. Now pour the sauce into the pasta and spinach and stir well. Season to taste and adjust flavours if necessary. You will be so happy you tried this recipe. I feel so much better today after following my night-out-recovery plan! I know what you mean about not going out often, but when you do, you make it WORTH IT. I go out so rarely lately but I make sure if I do it's a blast. I will have to try this recipe next time--or sooner!